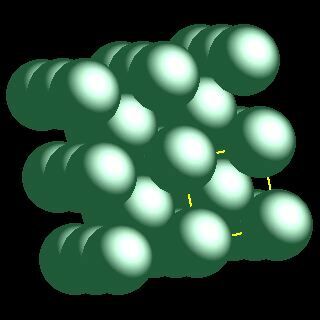 Niobium atoms have 41 electrons and the shell structure is 2.8.18.12.1. The ground state electronic configuration of neutral niobium is [Kr].4d4.5s1 and the term symbol of niobium is 6D1/2. Niobium: description Your user agent does not support the HTML5 Audio element. The solid state structure of niobium is: bcc (body-centred cubic). Reactions of niobium as the element with air, water, halogens, acids, and bases where known. Binary compounds with halogens (known as halides), oxygen (known as oxides), hydrogen (known as hydrides), and other compounds of niobium where known. Bond strengths; lattice energies of niobium halides, hydrides, oxides (where known); and reduction potentials where known. Niobium was discovered by Charles Hatchett in 1801 at England. Origin of name: from the Greek word "Niobe" meaning "daughter of Tantalus" (tantalum is closely related to niobium in the periodic table). 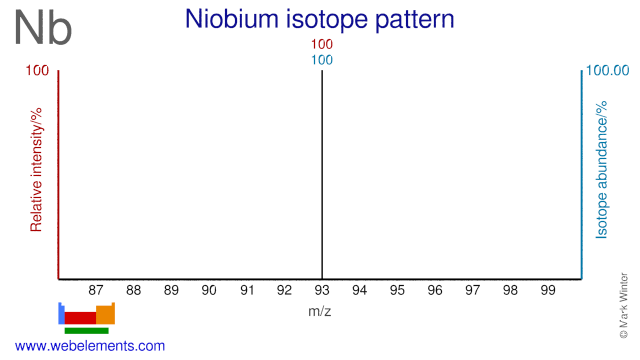 Isotope abundances of niobium with the most intense signal set to 100%. Isolation: isolation of niobium appears to be complicated. Niobium minerals usually contain both niobium and tantalum. Since they are so similar chemically, it is difficult to separate them. Niobium can be extracted from the ores by first fusing the ore with alkali, and then extracting the resultant mixture into hydrofluoric acid, HF. Current methodology involves the separation of tantalum from these acid solutions using a liquid-liquid extraction technique. In this process tantalum salts are extracted into the ketone MIBK (methyl isobutyl ketone, 4-methyl pentan-2-one). The niobium remains in the HF solution. Acidification of the HF solution followed by further extraction in MIBK gives an organic solution containing niobium. After conversion to the oxide, metallic niobium can be made by reduction with sodium or carbon. Electrolysis of molten fluorides is also used.